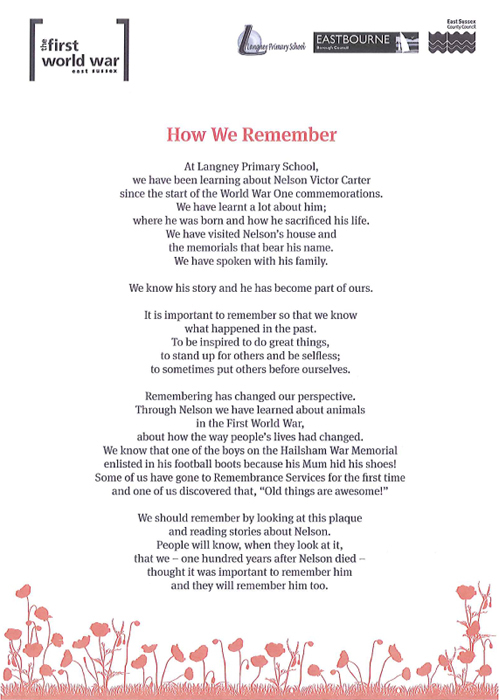 On 30 June 1916, whilst rescuing wounded soldiers from No Man’s Land, Nelson Victor Carter was killed in action during the Battle of the Boar’s Head. 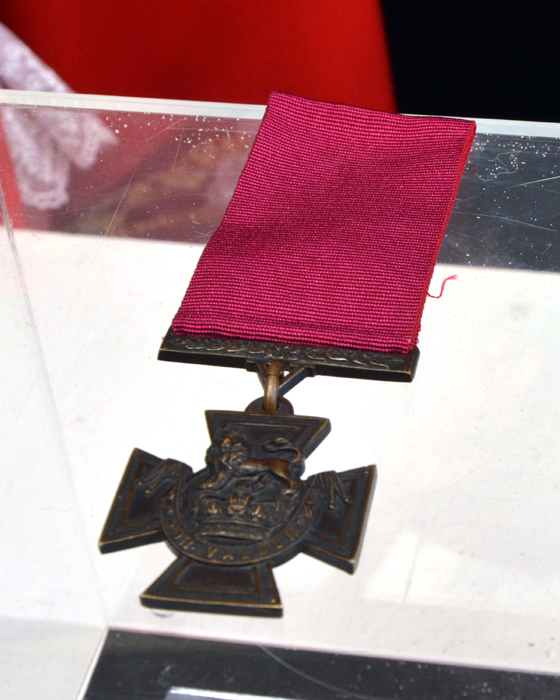 For his bravery he was subsequently awarded the Victoria Cross. 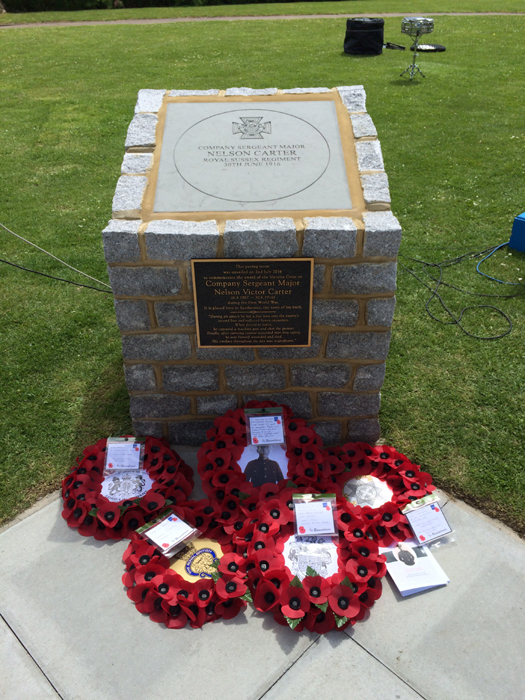 On 2 July 2016, a memorial for Nelson was unveiled in Eastbourne. 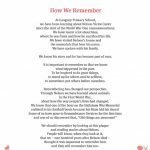 This is the story of how we did it. 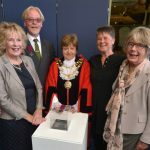 In August 2013, the Department for Communities and Local Government announced a competition for a memorial paving stone design to commemorate British recipients of the Victoria Cross during the First World War in their home towns. 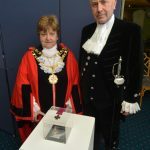 The winner was subsequently selected in November 2013, and plans were put in place for each town and county to begin receiving the memorial stones to place in whatever location and manner they saw fit. 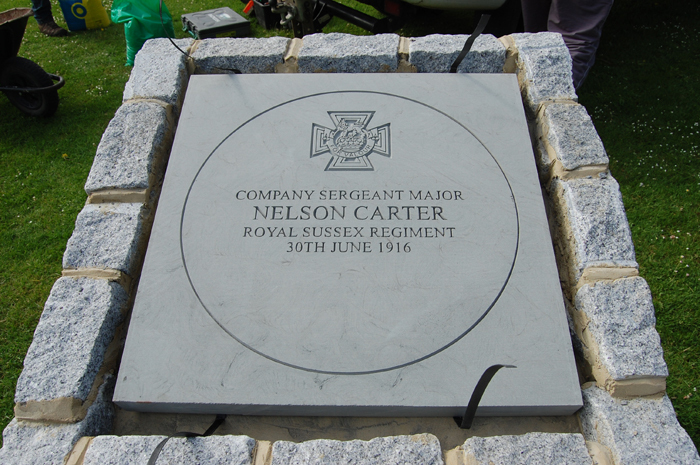 Having been born in Eastbourne and lived there at various points in his life it was decided that Nelson Carter’s memorial paving stone should go to that town. 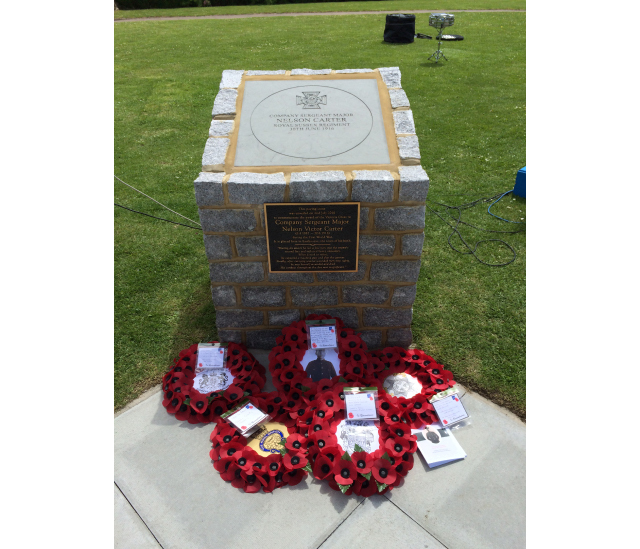 East Sussex had already unveiled memorial paving stones to two other VC recipients in 2014; Sidney Woodroffe and Cuthbert Bromley. 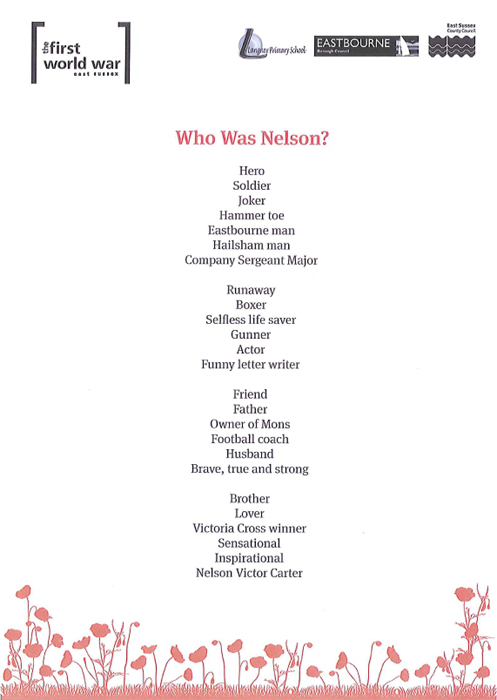 Nelson would be the third. 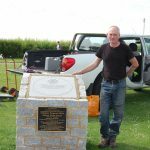 What would be the location of the memorial? 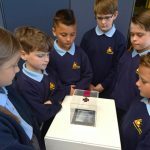 What would be its design? 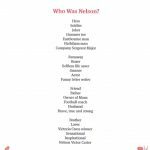 When would the unveiling take place? 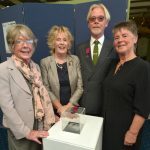 To answer these initial questions regular meetings began between Peter Finnis (Senior Head of Corporate Development and Governance) and Nicola Metcalfe (Personal Assistant, Corporate Development and Governance) of Eastbourne Borough Council, and Lee Banner (Policy Officer), Beth McGhee (Policy Development Intern), and Chris Kempshall (Project Officer for First World War Centenary Commemorations) of East Sussex County Council. 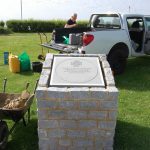 With the two previous paving stone memorials in East Sussex it had been important to find a location that was both fitting and suitable, and that would also allow members of the public to see it. 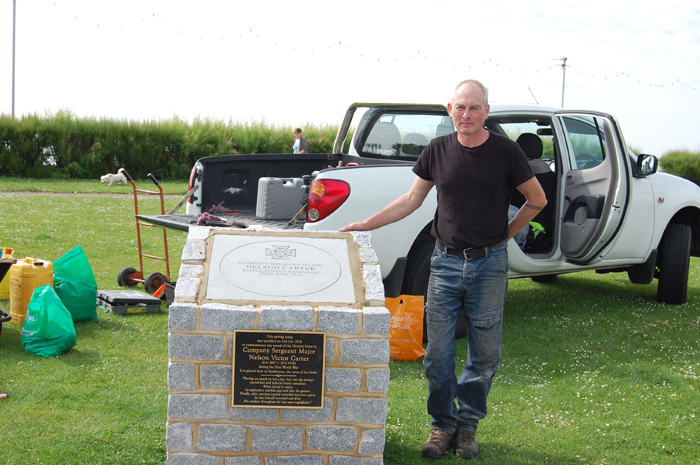 Most towns across East Sussex have a main war memorial commemorating those killed in the two World Wars. 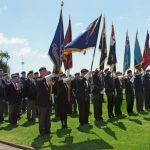 However, because of their role as a focal point for the community in the years immediately after the First World War they are often located at key road junctions without much additional space around them. 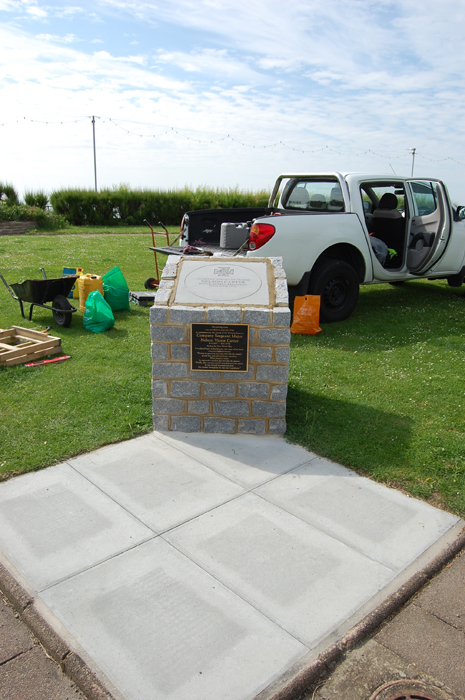 In order for the paving stone memorial to be frequented by the public, and also to allow for a full unveiling event, it was decided that more space would be needed than the Eastbourne War Memorial could offer. 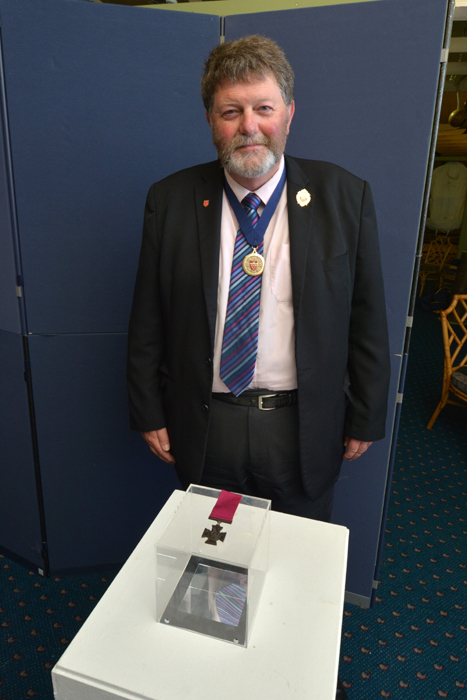 Fortunately there was a fitting alternative. 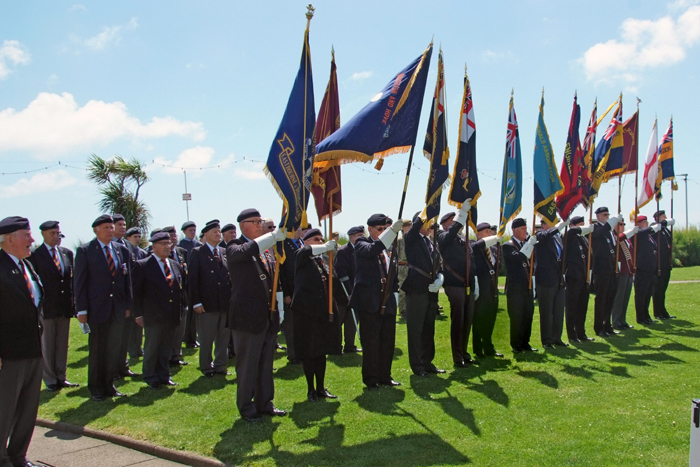 Eastbourne Redoubt has a long tradition of showcasing the town’s military history. 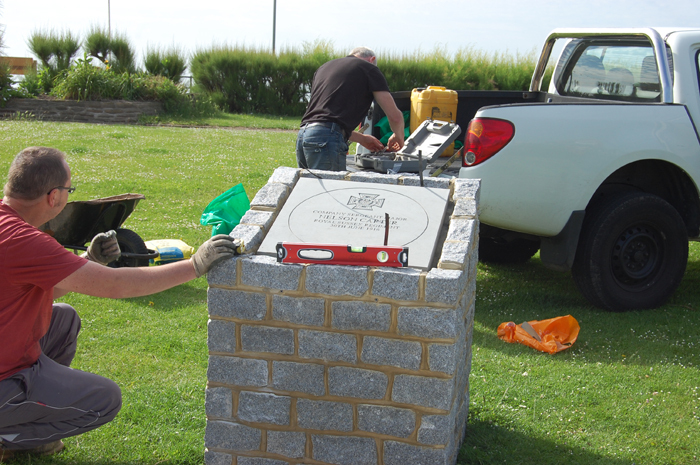 Both the fortress itself and the connected Pavilion Tearoom and gardens offer a substantial amount of space as well as an unobstructed view out over the shore to the sea. 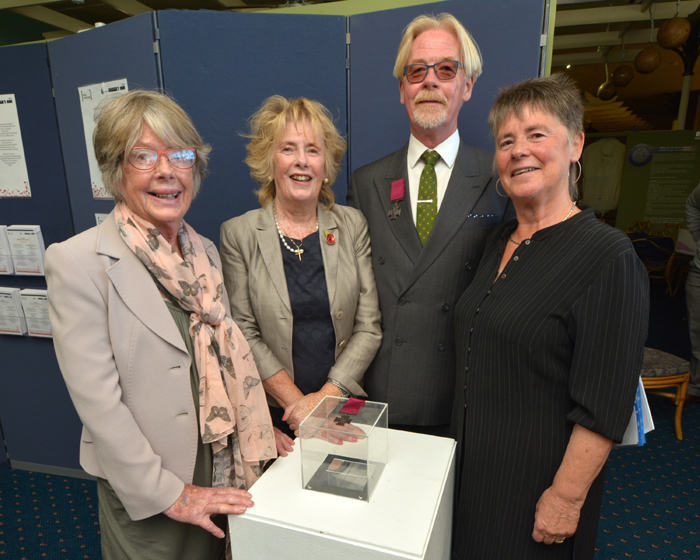 Moreover, Nelson Carter’s daughter had bequeathed his Victoria Cross to her four children. 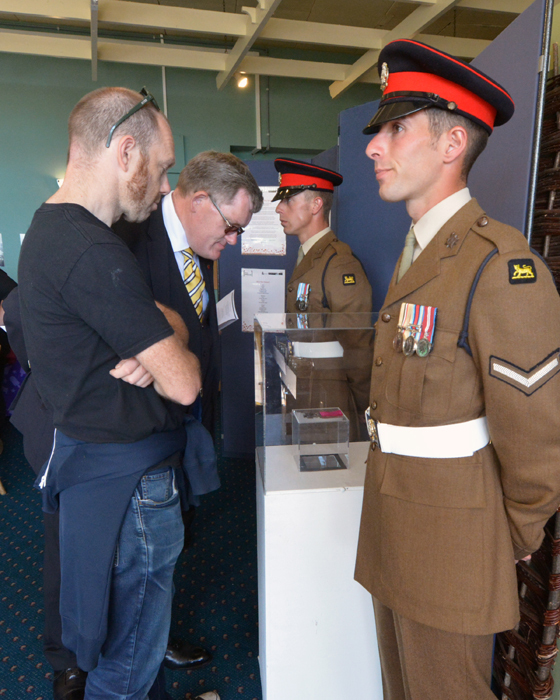 In time they then passed it on to the Royal Sussex Regimental Collection, which is held in the Redoubt museum in 2001. 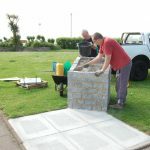 All of this made the gardens outside the Pavilion a desirable option. 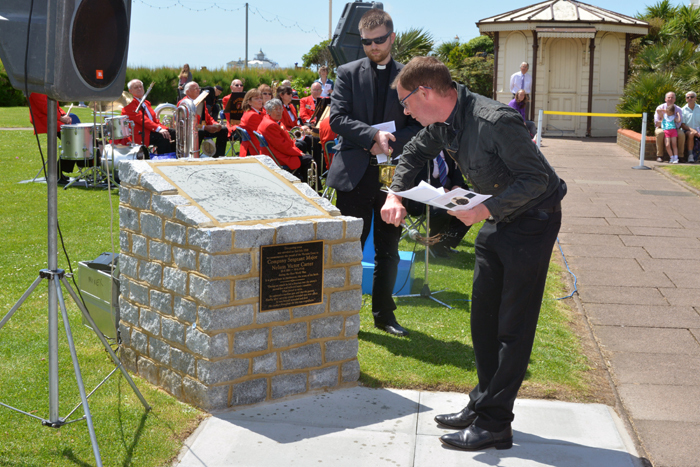 After consulting with Spyke Baker, Nelson Carter’s grandson, this location was deemed fitting for the placement of the memorial. 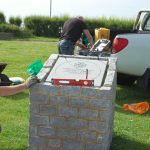 By the very nature of its design the paving stone memorials can either be laid directly in the ground or, alternatively, displayed upon a plinth or pillar. 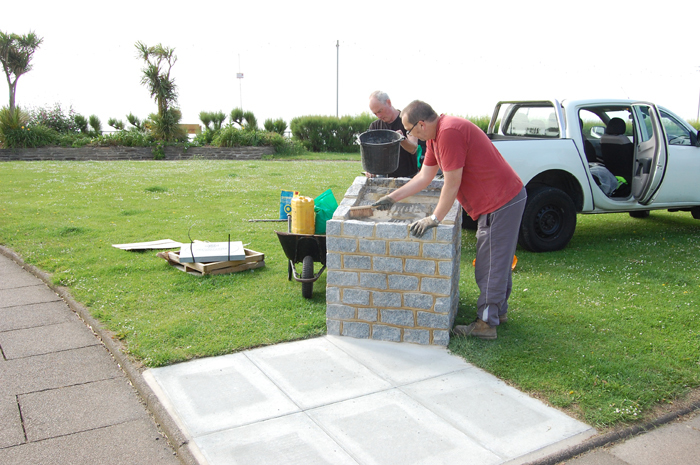 During the planning for Sidney Woodroffe’s memorial outside Lewes library it was decided that a plinth had the benefits of turning the memorial into a focal point and also removing the possibility that people could unwittingly walk upon the paving stone. 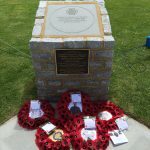 The gardens outside the Pavilion tearoom already host a memorial, on a plinth, to the men of the 9th Battalion, Royal Sussex Regiment who fought at the Battle of Pinwe in the Second World War. 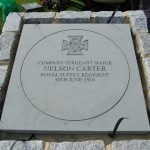 We identified that the addition of a plinth to hold Nelson Carter’s memorial stone would tie in with the existing memorial in the garden and also make it easily identifiable to passersby. 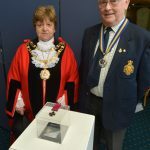 Alongside the plinth it was also decided that the memorial would consist of an explanatory plaque which would recite the citation details for Nelson Carter’s Victoria Cross from the London Gazette. 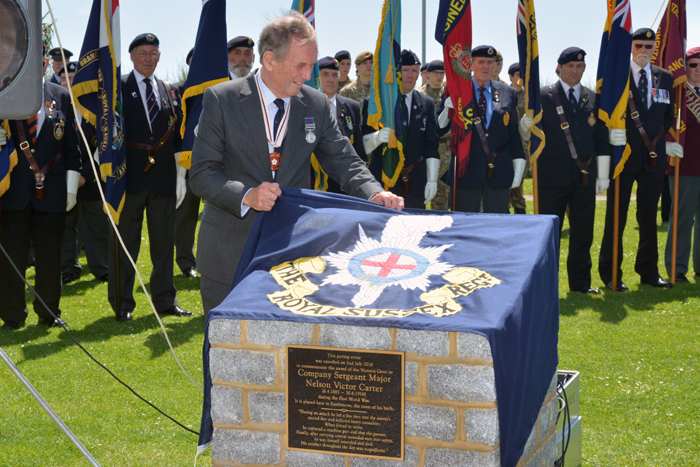 This plaque would also give key details as to the nature of the memorial and its date of unveiling. 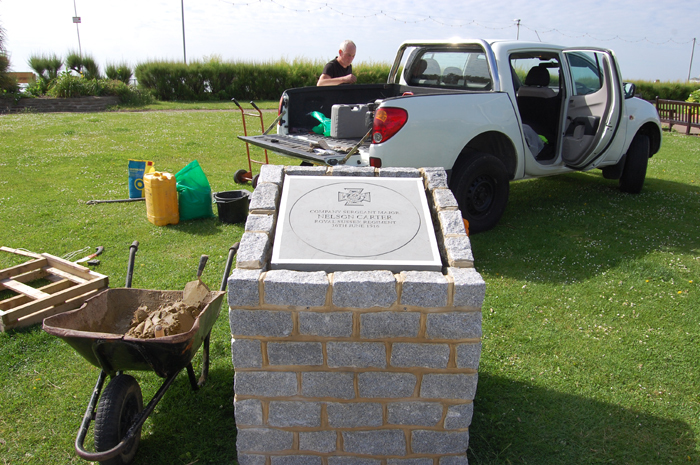 The job of organising the construction of the plinth and the sourcing of an explanatory plaque was given to Gareth Williams, Senior Specialist Advisor, Eastbourne Borough Council. 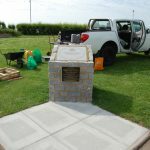 On 28 June, the memorial paving stone for Nelson Carter was installed on the plinth alongside the explanatory plaque, ready for unveiling. 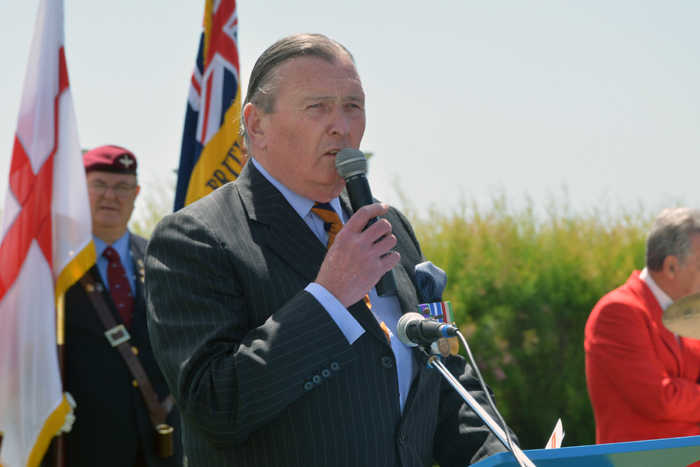 In recent years it has become tradition for members of the Royal Sussex Regimental Association and some of Nelson Carter’s descendants to travel to France to commemorate the men of the Royal Sussex Regiment who fought and died at the Battle of the Boar’s Head. 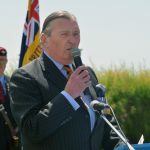 This trip has always been scheduled for 30 June, the date of the battle in 1916. 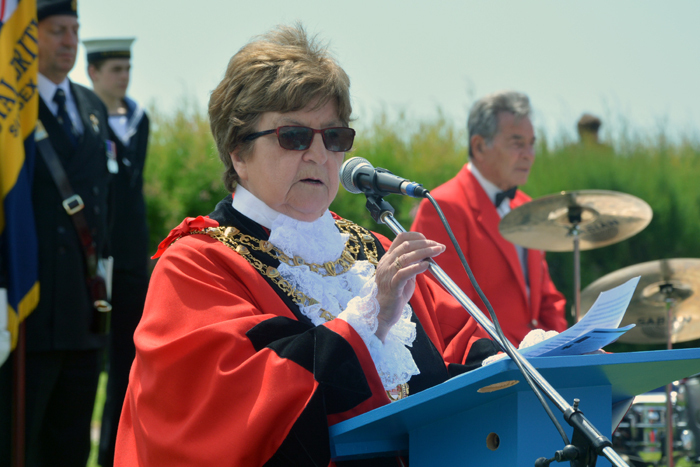 It was agreed that it was important for the Nelson Carter commemoration not to clash with events in France. 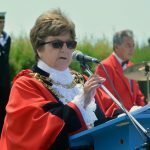 This meant that the days surrounding the 30th also needed to be kept relatively clear to enable people to travel to and from France. 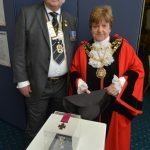 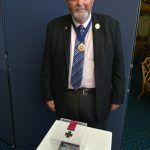 By delaying the unveiling ceremony until the first weekend in July it not only became much easier for Royal Sussex Regimental Association representatives and members of Nelson Carter’s family to attend but it also would allow more residents of Eastbourne to attend and pay their respects as well. 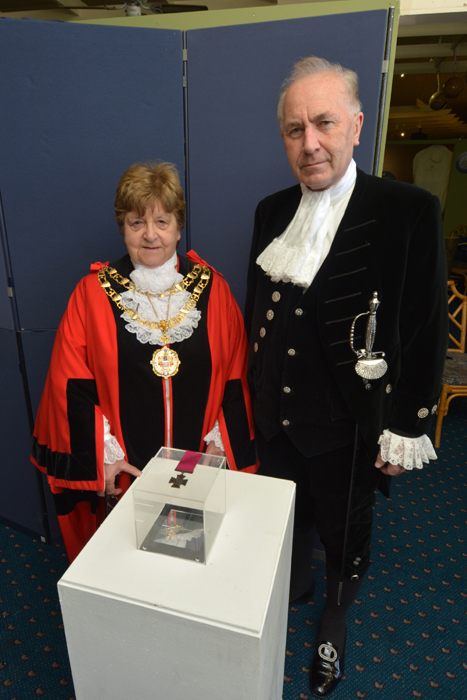 With this in mind the date for the ceremony was set for 2 July at midday. 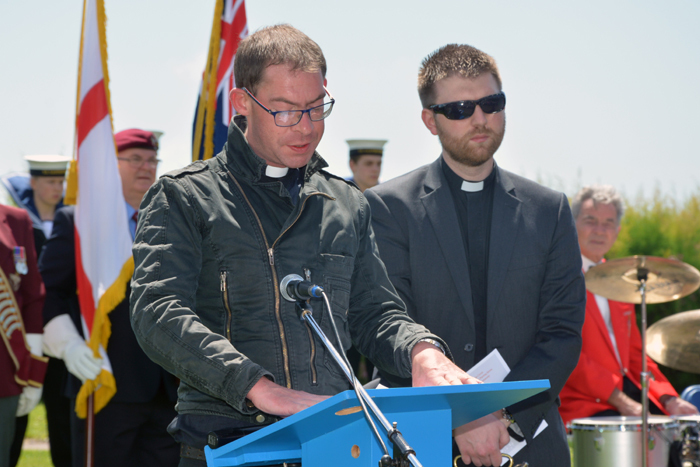 With the date for the ceremony set and the major preliminary details agreed, attention turned to the ceremony itself. 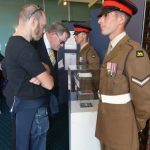 Previous ceremonies had provided a successful template for future ones but each would need personalisation to reflect the different nature of each occasion and the individual soldiers and towns. 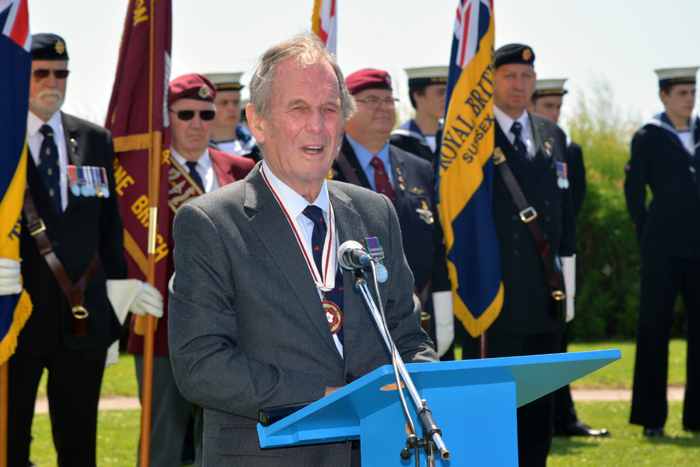 A list of local dignitaries and relations of Nelson Carter rapidly came together and invitations were organised through the office of the Lord Lieutenant for East Sussex. 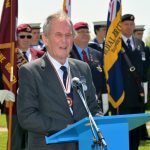 As the Queen’s representative to the county, the Lord Lieutenant would be the host for the event and all invitations were sent out in his name. 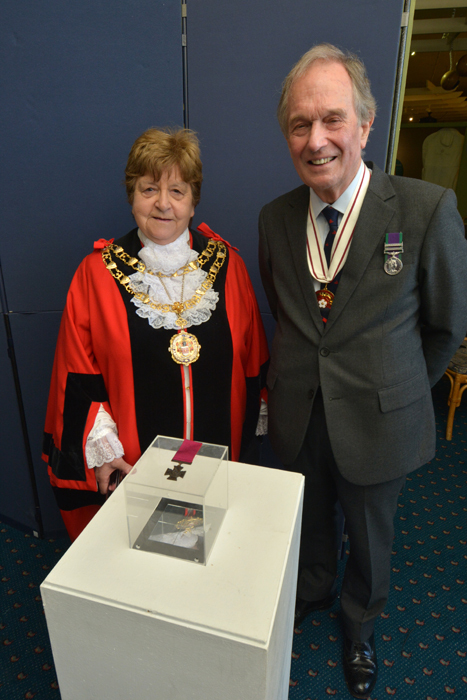 Whilst the Lord Lieutenant himself was unable to attend, he was represented by his Deputy Lieutenant Colonel Nick Richards. 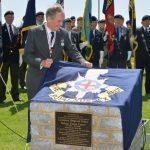 The Deputy Lieutenant would be given the honour of unveiling the memorial paving stone and reading Nelson Carter’s VC citation. 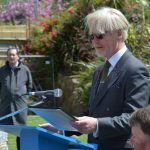 Additionally there would be further readings from Spyke Baker and Colonel Roderick Arnold, President of the Royal Sussex Association. 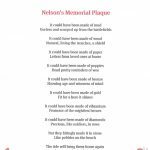 School children from Langney Primary School in Eastbourne had been working on a longstanding project to commemorate Nelson Carter, including writing poetry about him. 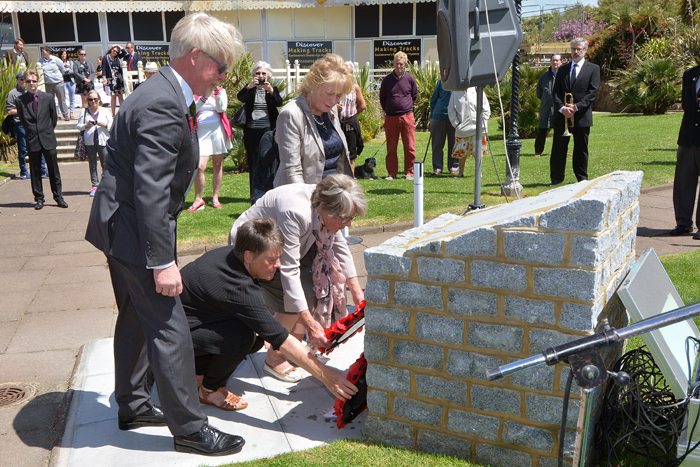 All parties were keen on including future generations of Eastbourne residents in this service of remembrance. 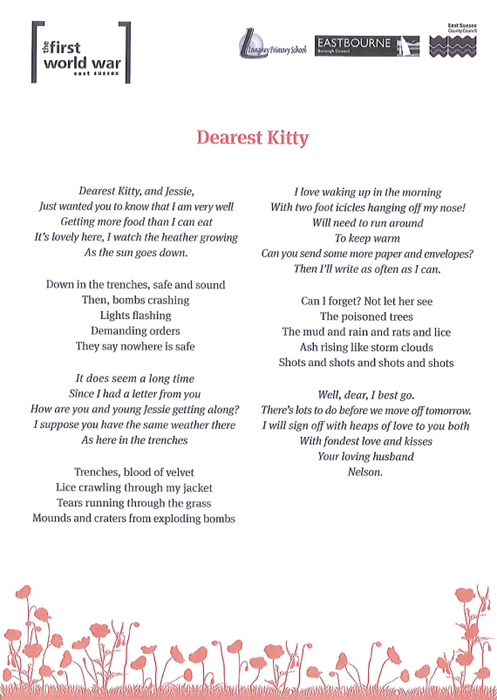 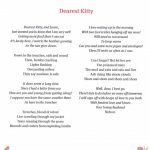 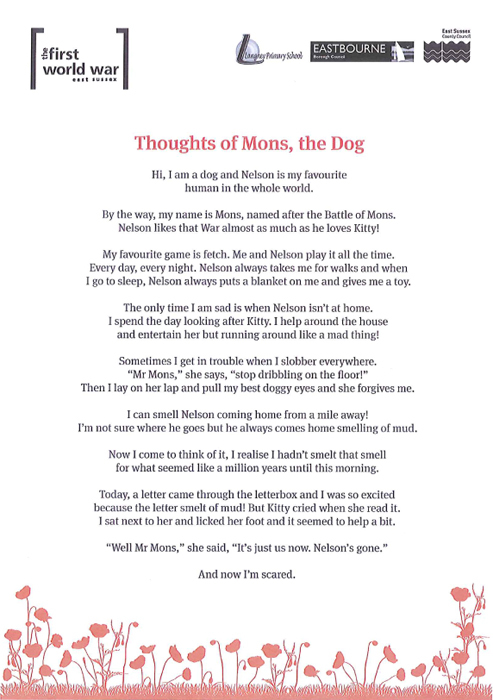 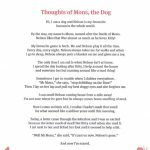 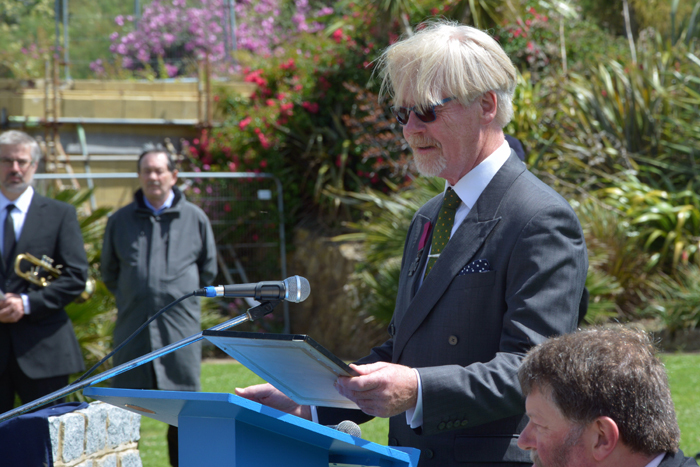 Therefore, Spyke Baker selected the poem he found most moving and appropriate from a group of six and four of the authors of the poem, Lee, Leo, Luke, and William were asked to read it at the ceremony. 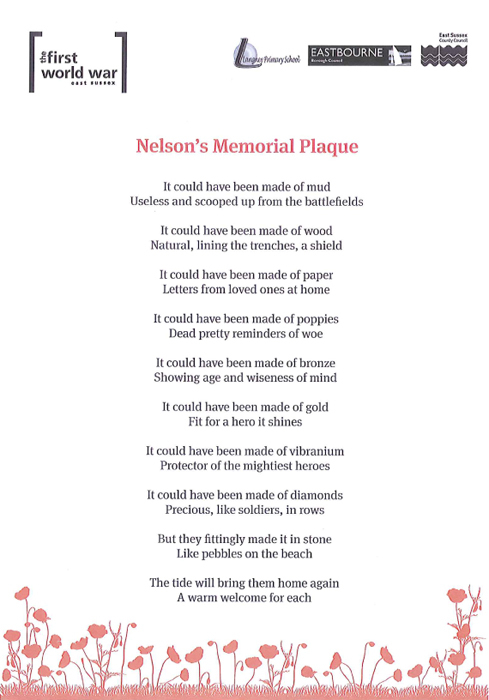 All of the poems written by the Langey School children would be displayed within the Pavilion Tearoom itself alongside Nelson Carter’s original Victoria Cross. 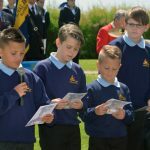 After the unveiling, memorial wreaths would be laid by the Deputy Lieutenant, Spyke Baker, Colonel Roderick Arnold, Dave Smedley of the Royal British Legion, and Philomena and Matthew from Langney Primary School. 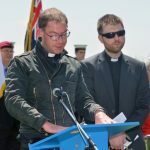 The stone would then be blessed by Father David Charles, Vicar of Christ Church with St Philip who would also read the Exhortation and the Kohema Epitaph. 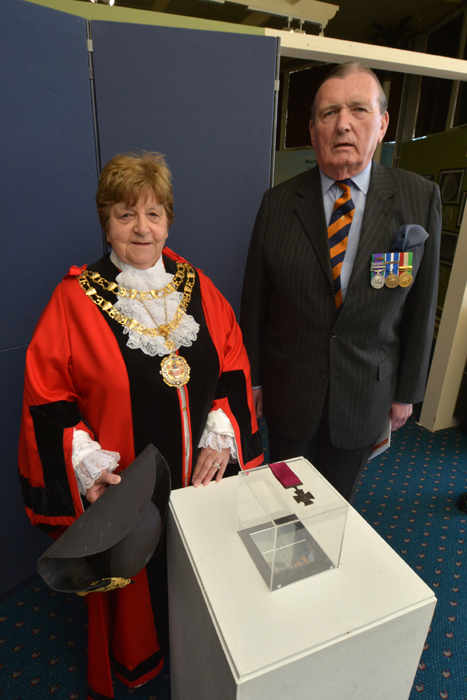 The ceremony would conclude with the sounding of the Last Post, a two minute silence, and the Reveille. 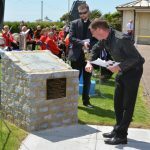 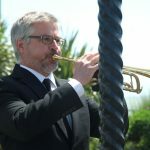 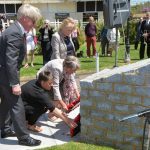 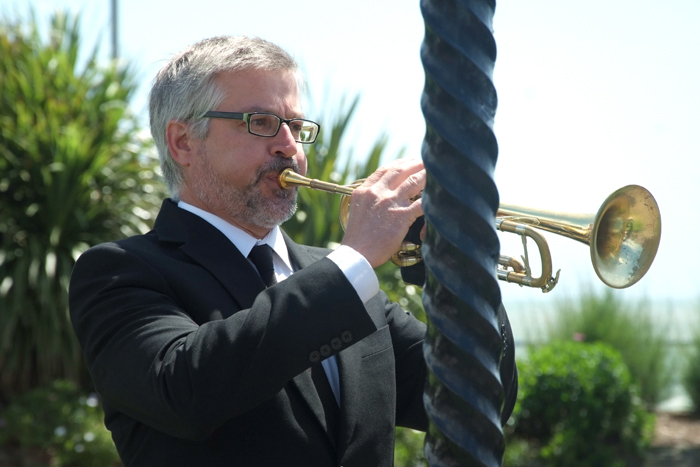 In glorious sunshine on Saturday 2 July 2016, hundreds of people gathered in the Pavilion Garden near Eastbourne Redoubt to pay tribute to the memory of Nelson Carter. 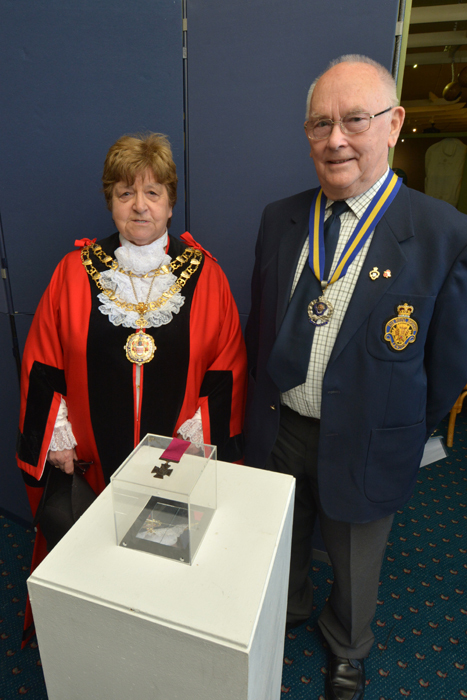 Dozens of people had been involved at every stage of the ceremony from its inception to its culmination. 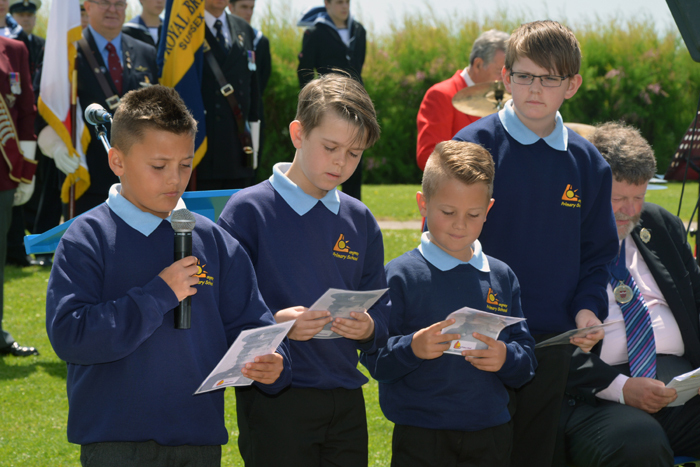 Here, some of them look back at their role it commemorating Nelson Carter. 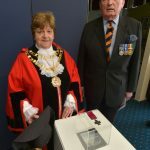 “We were already in the process of planning a series of World War 1 commemorative events when we learned of the Government’s initiative to provide memorial stones for those individuals who were awarded the Victoria Cross for outstanding bravery during the conflict. 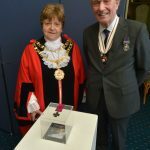 Knowing that Eastbourne had one such recipient in Nelson Carter, it was always going to become the centrepiece of our commemorative activities. 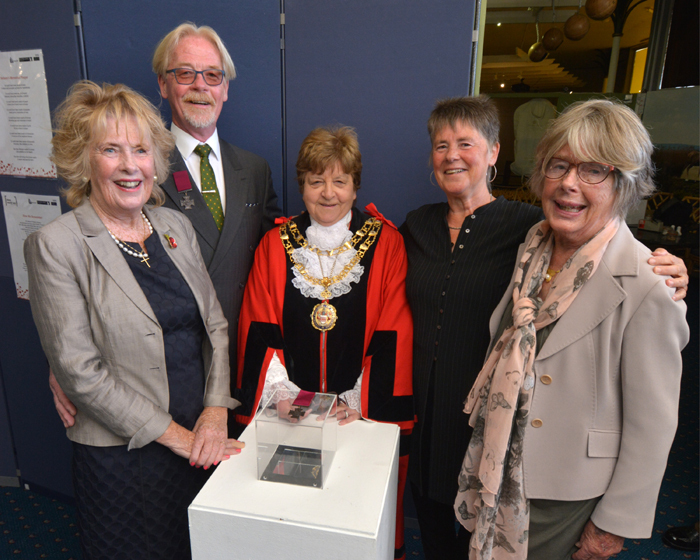 It was also clear to us from the start that this was to be a very poignant event and it was soon lent additional importance when we were able to make contact, and work, with current day members of Nelson Carter’s family and, in particular, his grandson, Spyke Baker. 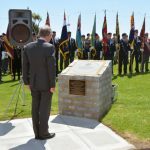 “The Regimental Association is proud to be part of the government sponsored programme for honouring the WW1 Victoria Cross recipients with memorial plaques. 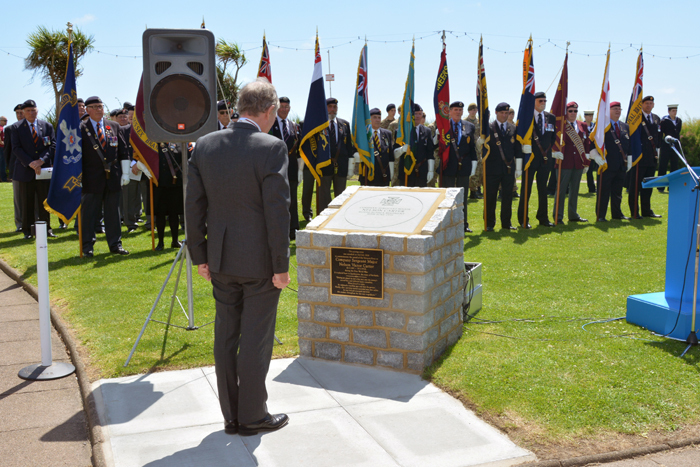 The Regiment won 4 VC’s during the conflict and the ceremony in Eastbourne is the second one of ours to be unveiled. 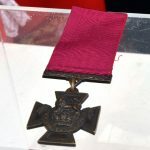 and it is always an honour to mark the occasion in style to honour the awarding of the country’s highest award for valour in the face of the enemy. 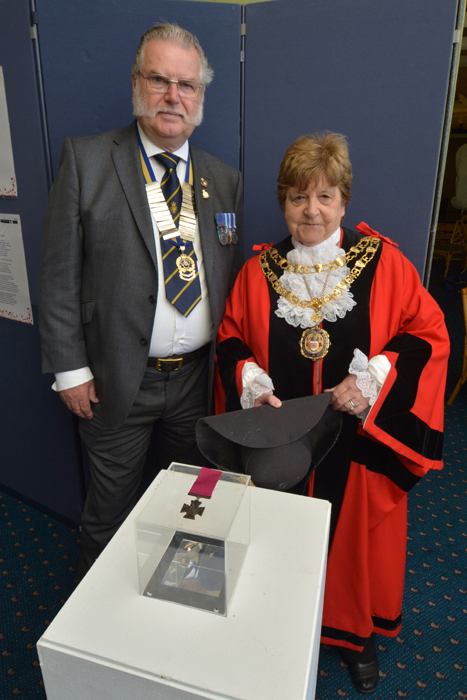 “I was honoured to be asked to unveil the Memorial Stone to commemorate Nelson Carter’s Victoria Cross on behalf of the Lord Lieutenant. 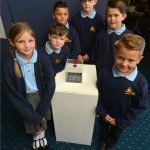 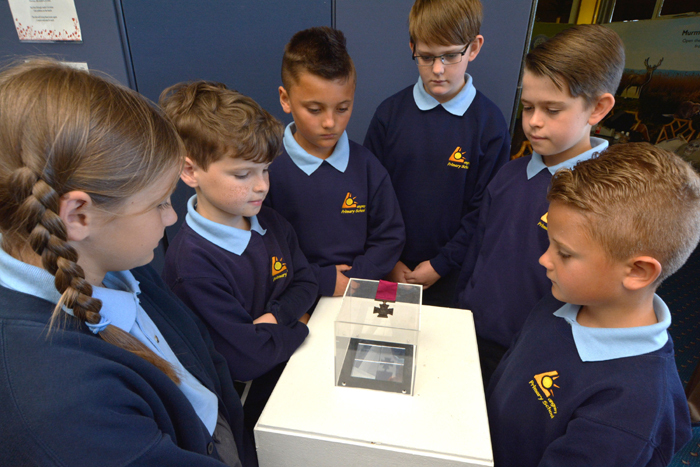 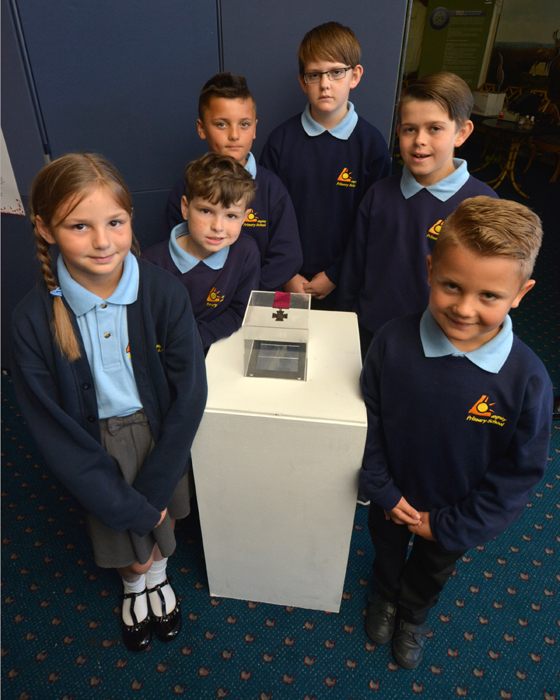 The ceremony itself was not only a very fitting tribute to an incredibly courageous man, who finally gave his life rescuing his wounded comrades almost exactly 100 years ago, but it was also provided an inspiration for the future as personified by the six young pupils from Langley Primary School.